A quick visit until I can do more to say hello and a lovely card Pat. Fabulous card Pat. I too have neglected the few Hanglars I was able to purchase...way back when! This is beautiful. Love all the decorative hearts. OMG Pat this is stunning I totally adore that beautiful Hanglar image and what a fantastic design, this is one awesome card. 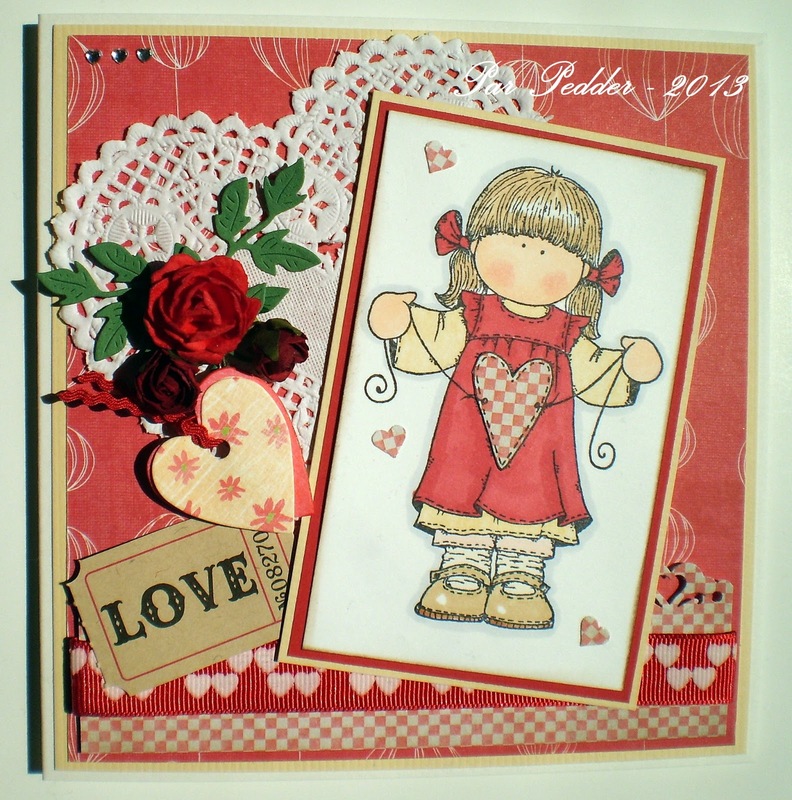 A gorgeous card Pat - love that fabulous red rose especially. I love what you've done with this card Pat, especially how you've used the DPs. Wonderful job my friend and best of luck in all those challenges. "Hugs"
Such a sweet card, Pat. I just love the special touches like the heart doily and the love ticket! This is a really sweet and adorable card, love your hanglar image and all your embellies look great. Such a sweet card love all the embellishments. Thank you for playing along this week at Jen's Digi Stamps. Good luck in the challenge and I hope to see you in the next challenge. Very cute! Love the doily and how you hung your heart like a charm. Thanks for playing in Squigglelfy's challenge this week! Sorry not commented earlier, I couldn't get on your blog? No idea why! Gorgeous card hun, just love the doily & the image is fab! Beautiful card! Such a sweet image! I love the paper-pieced heart! Thanks for playing along at Shopping Our Stash this week! Adorable! Love the image and that heart doily. Thank you for playing along with us at Sassy Studio Designs! Love this image Pat and how you´ve paper pieced the heart. Another gorgeous card, as always sweetie. I don't know how you are able to create so many gorgeous cards between my visits but you sure do!!!! You are a pleasure to visit Pat!